Not really, says the American Heart Association. 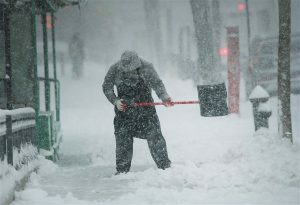 While most people won’t have a problem, shoveling snow can put some people at risk of heart attack. Sudden exertion, like moving hundreds of pounds of snow after being sedentary for several months, can put a big strain on the heart. 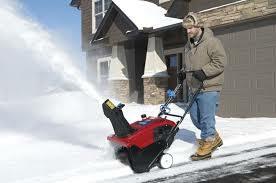 Pushing a heavy snow blower also can cause injury. Cold weather can increase heart rate and blood pressure. It can make blood clot more easily and constrict arteries, which decreases blood supply. This is true even in healthy people. Individuals over the age of 40 or who are relatively inactive should be particularly careful. Don’t pick up that shovel without a doctor’s permission if you have a history of heart disease. A clear driveway is not worth your life.